This decorative jewellery organiser on it's compressed wooden stand is a fun way to display jewellery. With many places to hang earrings, necklaces, rings and bangles. The search is over! 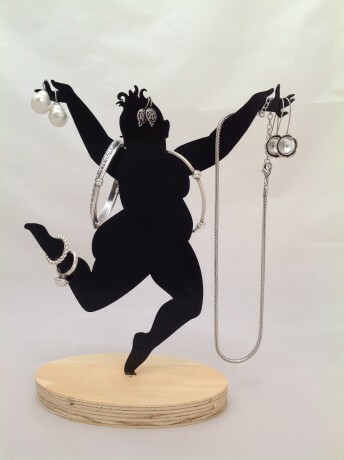 This jewellery tidy which is part of our 'African Mama' range will be a quirky, fun yet practical present for the jewellery lover or someone who is difficult to shop for. The sturdy black metal 'Mama Ta Dah!' figure stand is part of our 'Mama Africa' range and will add contemporary style and glamour and a fun element to any dressing table. A proudly South African product.